These air mattress reviews of leading brands such as Aerobed, Coleman, Wenzel and Intex will help you to find the most comfortable and affordable inflatable mattress air beds for overnight guests, a spare bedroom, or camping adventures! 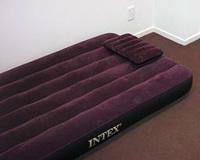 Air mattress reviews are an excellent resource when shopping for a comfortable inflatable bed. Consumers are honest about their experiences, whether positive or negative and all that information can be used to help you make a decision on which brand or style of air mattress you purchase. Air mattresses or inflatable beds aren't just for camping any longer. New uses include: guest rooms, first apartments, roommate situations, college dorm rooms, and temporary sleeping situations. Air mattress manufacturers have stepped up the comfort, durability, and portability of their products to meet the ever-changing needs of our increasingly mobile world. The benefits of an air mattress: portable, durable, easy to use, inexpensive, and comfortable. AeroBed is the leading brand of air mattresses on the market today. They're durable, made from high quality components, portable, and very comfortable. AeroBeds feature adjustable firmness by allowing more or less air into the mattress. They offer the traditional air mattress that sits on the floor and an elevated air mattress that brings you up off the floor and resembles a real bed. The Coleman brand has long been associated with top quality camping gear because consumers can depend on their products to last through years of roughing it in the outdoors. Coleman air mattresses generally include an air pump, are manufactured using an exclusive PVC formula, and are built to withstand up to 600 pounds of pressure. They're comfortable, portable, a great value and feature an integrated wrap and roll system that enables you to deflate, pack and transport in no time. Intex offers two product lines: camping and in-home air mattresses. The camping air mattresses are the classic design that sits directly on the floor. A pump is included. The in-home air mattresses feature an elevated design with a memory foam topper for ultimate comfort. It's important to note here that consumer after consumer reported that the Intex mattress leaked after only a few hours or a few days. The return policy is good for only 30 days with a receipt in most cases. The warranty on these mattresses is only 90 days. Best Liked Intex Air Mattress: The raised air mattresses from Intex seem to get the best reviews. Wenzel manufactures air mattresses are built for roughing it outdoors or for lounging around indoors. Their air mattresses offer support, comfort, and ease of inflating and deflating. They're ideal for camping, guests, or dorm rooms. The Insta-flex line is perfect for adding a comfortable place to read, relax, or sleep in any room of the house. Ozark Trail makes inexpensive air mattresses, but according to the majority of customer reviews, you get what you pay for with this brand. The pros included: lightweight and convenient carry bag. The biggest disadvantage consumers quoted was that the air mattress doesn't hold air for very long at all. Many consumers reported that they went through 4, 5, or 6 Ozark air mattresses trying to find just the right one and all of them were either returned or thrown away!